The best bad movie you'll ever see comes to a midnight screening at Oakland's Piedmont Theater. 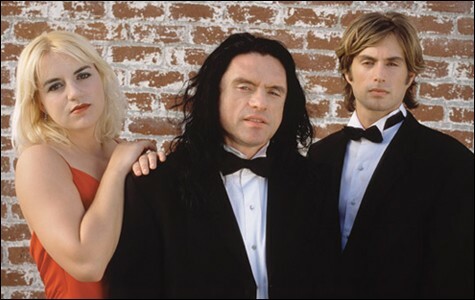 The cast of The Room. When the The Room first opened in 2003, it was roundly panned. The few publications that deigned to review it said it was among the worst movies ever made, and the two LA theaters showing it reported audiences walking out en masse just minutes into the film. Despite a $6 million budget — financed by director, producer, and star Tommy Wiseau — and a marketing blitz that compared the film to the work of Tennessee Williams, it grossed just $1,900. Which pretty much sums it up. This is a film that's not just bad in your standard box-office flop kind of way: It's amazingly, abysmally, above-and-beyond-the-call-of-duty awful. Characters and plotlines are introduced without explanation and then dropped unceremoniously; Wiseau's character speaks, inexplicably, with a hammy, thick Austrian accent; and many of the scenes — set in San Francisco — take place in front of a comically cheap-looking green screen. "Really, it's indescribable," said Nicole Galarza, a manager at the Piedmont Theater (4186 Piedmont Ave, Oakland), which starts a series of midnight screenings of the film this weekend. "You kind of need to see it to believe it."